It’s through no fault of its own that The Humbling, Barry Levinson’s rambling adaptation of a recent Philip Roth novel, bears a certain passing resemblance to one of last year’s most acclaimed films. Here, again, is the seriocomic tale of an aging, washed-up actor—played by an aging, arguably washed-up actor, in a bit of art-imitating-life stunt casting—who begins to lose his grip on sanity while preparing for what could be a Broadway comeback. The accidental similarity, plain as day on paper, becomes even plainer on the screen: Minutes into the film, stage and cinema veteran Simon Axler (Al Pacino, himself a veteran of both Broadway and Hollywood) ambles out of his dressing room, the camera following close behind; gets locked out of the back entrance of the theater, and must come in through the front; and dramatically inflicts some violence upon himself before a shocked live audience. Sound familiar? Even, however, if its thunder hadn’t been immediately stolen by Birdman, which premiered three days before it at last August’s Venice International Film Festival, The Humbling would still look like a folly. Bad timing is the least of its problems. There is some charm, admittedly, to seeing a past-his-prime Pacino actually show up for work, even if he is playing more of an idea—the artist in decline, Roth in thespian drag—than a real human being. Following his literal, onstage belly flop and a short stay at an insane asylum, a suicidal Axler quits acting and retreats to his enormous upstate New York home. Here, while dodging offers from his agent (Charles Grodin), he’s paid a visit by Pegeen (Greta Gerwig), the grown daughter of some old colleagues. Though she’s dated only women for the last 16 years, Pegeen swiftly seduces Axler; their subsequent relationship draws several other characters out of the woodwork, including her infuriated parents (Dan Hedaya and Dianne Wiest, both very funny), her distraught transgender ex (Billy Porter), and an infatuated college dean (Kyra Sedgwick), who warns Axler that the young woman will “take you apart like a Christmas toy.” There’s also a useless subplot involving a crazy woman (Nina Arianda) set on hiring Axler to murder her pedophiliac husband, and a less useless faming device—an invention of screenwriters Buck Henry and Michal Zebede—in which the protagonist carries on expository Skype conversations with his therapist (Dylan Baker). When it was published six years ago, The Humbling earned Roth some of the harshest reviews of his career, with many critics accusing the revered author of indulging in a pathetic, May-November sexual fantasy. On-screen, the scenario plays less skeevy than simply tedious—a long wallow through the anxieties of a fading star. Gerwig never encountered a line reading she couldn’t neurotically nail, but she’s severely miscast as a callous heartbreaker. Not that the movie ever regards Pegeen on her own terms, as anything more than a catalyst for Axler; she’s a dirty old man’s salvation and destruction, rolled into one. The Humbling is interesting only in how it fits into the filmography of its major talents. For Levinson, who shot the film on the cheap in and around his own Connecticut home, it’s a chance to free himself from the shackles of studio hack work. (He’s like a Broadway mainstay going black box, though the results feel refreshing mostly just as an alternative to, say, Envy.) 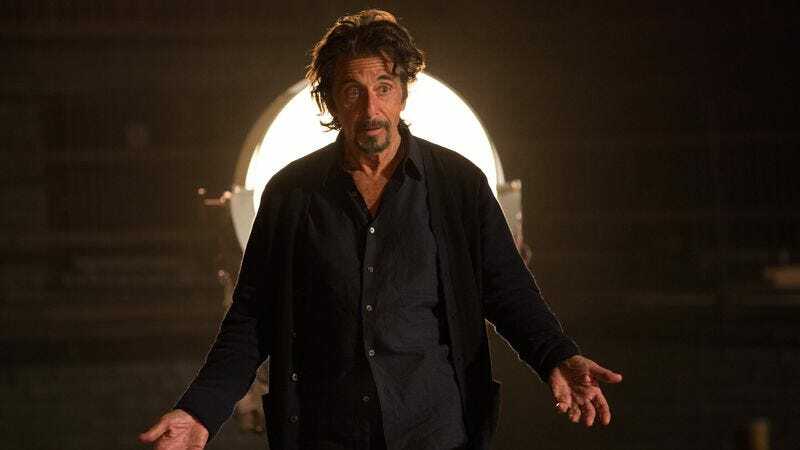 And Pacino—delivering off-the-cuff monologues, playing straight man to various loons, only once engaging in some characteristic bellowing—seems to have rediscovered his passion for the craft by playing a man who’s lost his own. He and Levinson both appear rejuvenated. Now they just need to apply that renewed energy to less tiresome and navel-gazing material.